American TV cook extraordinaire Julia Child makes for interesting television. Is she Australian? Is she drunk? If she’s not drunk is she just out of control? Or is she a gem of a TV personality the like we’re unlikely to see again? Watching her in this clip, it’s difficult to imagine that television will ever be made like this again. I see no edits in this 7 minute sequence. I don’t see something scripted. I see something off-the-cuff. Rehearsed, yes. But off the cuff. Genuine. Authentic. Brilliant television. Oh .. and I’ve learnt how to make an omelette. Little wonder this gem of 70s TV inspired a real-life 30something to commit to a personal challenge to cook her way through Julia Child’s cookbook on French cookery …. and blog about the experience too. The resulting film – based on two true stories – is a maze of smoking mirrors. Art inspires life. Life inspires art. A film made from the story of a blog documenting the path followed cooking your way through a book published 40 years before. Somehow, it’s difficult to imagine a blogger doing the same about the original UK kitchen goddess Delia Smith. No. I’m not about to start. The joy of the film isn’t that it’s about food. Yes, both me and Significant Other did repeatedly keep thinking about the chicken stew bubbling away in the Crockpot but what resonated more was the sincere treatment of a blogger. Depicted writing in 2002, the Julie character isn’t presented to the audience as some kind of freak. In fact, she’s presented as someone desperate to find improvement on life. Writing – and more important self-publishing – provides that. “I could be a writer,” squeaks Julie to her strange looking husband. “You already are a writer,” was his response. Add to that the unexpectedly reassuring lines throwing light on the experience of blogging – “I’m just putting it out there” and “I’m not sure whether anyone’s actually reading it” – and it’s not long before writers everywhere start reaching for their keyboards and blogging their love for the film industry finally validating their core passion. The shame is that they all probably did that months ago. The film was released in 2009. I can’t believe it’s taken me this long to get around to watching it. God Bless Sky Anytime+ for including it in their current market stall of immediately available films. 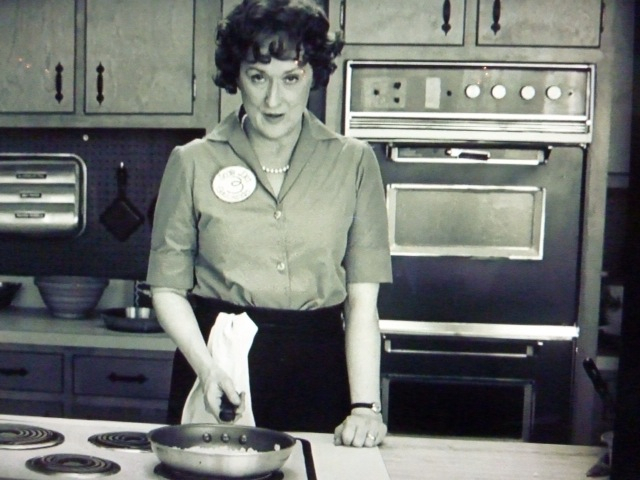 When you get around to watching it, see how you marvel at Meryl Streep’s brilliant characterisation of Julia Child. 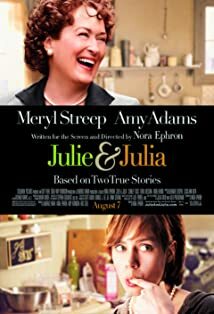 In this film at least, Julia’s relationship with husband Paul is depicted with the warmest, most engaging of tones. A real tonic. This is not in any way a dysfunctional relationship. Quite the opposite, in fact. I have a confession to make. I don’t listen to anywhere near as much Radio 4 as I ought to. You’d think I’d listen to more. It’s only by listening you can get a sense of what works and what doesn’t. And if you’re going to specialise in it, you’re going to need to know that kind of thing. Not least because you’ll know what’s been done before. There’s nothing quite so embarrassing as pitching an idea that’s already been produced. Contrary to the perception of how radio makes few demands on the listener (“I listen to it when I’m doing the ironing”), I need a distraction free environment to fully appreciate speech radio. The office environment can be hideously distracting a lot of the time. That’s why it was my Significant Other who plucked this gem from yesterday’s PM on BBC Radio 4. There are a number of elements which contribute to making this a cracking 10 minutes of radio. The opening 60 second mashup of clips from contributors throughout the week grabs my attention right at the start. The mashup seduces the listener, toying with his/her perceptions by suggesting that news people can be a bit anarchic in their view on the world. The remaining 9 minutes are simple in origin. Eddie Mair links a series of voiced contributions sent in from members of the public. Simple is good. We like simple. The order of contributions is vital to the success of the piece. A balance of views (from cantankerous negativity to positive affirmation) is a given, naturally. But it is the range which makes the piece engaging. The listener is taken from witty and poignant (“..a symphony between the gale force wind outside and the computer fan inside”), to witty (“all I heard was my wife practising her violin – never do this again”) and thoughtful (“it felt as though all us listeners were folding in on ourselves”). While Mair’s links and asides keep the pace, it is – fundamentally – the writing in these contributions, ruthlessly edited down which keeps attention focussed throughout. What is in effect an extremely long segment, it’s ultimate success is proving beyond any reasonable doubt that the “three minute attention span rule” trotted out by ill-informed production “experts” is nonsense. If it’s engaging, people will listen. :: Listen to the full edition of PM from Friday 12 November 2010 via BBC Programmes. :: Follow PM on Twitter. The PM blog is quite special too. :: The picture used in this blog post was published on Flickr by Guido AJ Stevens and is used here under licence. Mail-order movie rental company LoveFilm have launched their PS3 console service this week. Full-subscribers pay out £9.99 to gain access to a library of DVD-quality films, concerts, documentaries and other TV programmes which can be streamed direct on to the TV if available. DVD and Blu-Ray copies can also be ordered via the console, delivered a few days later. £9.99 a month? What? That’s like £120 a year. Not a bad subscription rate – comparable you might say. There’s a thought. Pay a monthly rate and gain access to a library of stuff you can watch on the TV whenever you want. I wonder whether that idea will catch on. I wonder. The application works well. The interface design is pleasingly clean. Realistic user experience design and efficient code make the application a pleasing one to use. I like the fact that if I’m searching for a programme title it will adapt the navigational options for ‘Watch Now’, ‘DVD’ and ‘Blu-Ray’ appearing according to availability. The fast-forward function works well (multiple speed options available by hitting the R3 button on the controller), although I can see how some might consider the lack of visual scrubbing to be a failing. Personally, I don’t. My Saturday afternoon spent nosing around the LoveFilm library saw me peer at the Norwegian film Let the Right One In, momentarily forget how bad Carry on Cleo and settle down cosily on the sofa with the Pet Shop Boys’ live gig from the Savoy Theatre, London. Lead singer Tennant looked surprisingly young and handsome while Chris Lowe did his usual ‘I’m not really doing anything’ schtick. But both were – understandably and probably deliberately – upstaged by their backing vocalist Sylvia Mason James. She is fantastic. By far the most entertaining was a near-acoustic performance of a classic PSB track Rent. One beautiful crowd pleaser. Although their (surely ironic?) mix of Somewhere from West Side Story proves that just because you can, doesn’t necessarily mean you should. I mean really, who really thought this was a good idea? God bless conductor Thomas Sondegard whose recent concert with the Royal Scottish National Orchestra turned out to be an unexpected joy to listen to on BBC Radio 3. Whilst I agree with Peter Cudmore’s assessment of piano soloist Lukic’s “immaculate, sparkling performance” of Rachmaninov’s Paganini Variations for piano and orchestra, I’m of the mind his assessment of the Nielsen symphony – ‘The Inextinguishable’ – performed in the second half of the concert stands as an indispensible primer for the composer’s work. It was exciting. Gripping, in fact. All in all an engaging listen. Still, each to his own. Is this clip – quite possibly – now the best feelgood dancing at a party clip? It is for me. Possibly because it is exactly what I used to dream of doing when I was a spotty teenager desperate to feel comfortable at otherwise painful sixth form parties. The opportunity to say ‘look at me – I’m not such a dweeb after all’ was all too difficult to avoid dreaming about. And, it might just be the case that I *may* have realised that dream in the safe confines of my bedroom .. from time to time. It’s from the recent comedy drama wotnot Whites which has – contrary to what I heard one ill-informed PR-type say during a tiresome event recently – been brilliant. Not least because far from concluding the series with a happy ending for everyone, character Skoose – the ‘dancer’ in this clip – gets his comeuppance from the boss he was trying to impress. It turned out he wasn’t the ‘big I am’ he thought he was when he arrived in his new job at the beginning of the series. And, as we all know, there’s nothing better than seeing someone getting their comeuppance.